This year’s contestants are all from the Navajo Nation. Paige Augustine, is a sophomore studying nursing and Native American Studies; Lakeisha Kee, a sophomore studying biology, health medicine, and human values; and Caitlynn Mayhew, a Junior studying biology, chemistry, and Native American Studies. 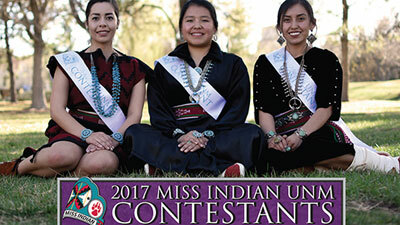 The Miss Indian UNM program was founded in 1952 by the UNM Kiva Club student organization. Miss Indian UNM serves as an ambassador for The University of New Mexico and the surrounding American Indian community through participation in conferences, workshops, powwows, tribal ceremonies, parades, school visitations, special appearances, various socials, and a variety of UNM-affiliated events. For more information on any of the contestants or the pageant, visit AISS Miss Indian.